Eagle Lake at Plantation North community is sold out and is not in active development by builder. If you are interested in Eagle Lake at Plantation North or similar new home communities, contact us today! Our agents are very familiar with new and newer construction in Chesapeake, and can identify resale opportunities in Eagle Lake at Plantation North, as well as builder inventory available in nearby or similar communities in Chesapeake. To view 9 more pictures, interactive maps and the full, detailed description of the Eagle Lake at Plantation North community, please Login. Find your next home among the houses for sale in Eagle Lake at Plantation North. This contemporary real estate is just what the homebuyer of today is looking for. Perfectly situated in the Greenbrier section of Chesapeake, VA, this community offers high standards at affordable prices. This area is great for hitting the shops, going to school or commuting to local military bases like NAS Oceana, the Coast Guard Finance Center and Norfolk Naval Shipyard. Checking into these houses for sale is checking off many items on that dream house list. Each new home was carefully crafted with modern appointments and upscale features. This bustling region of Virginia is alive with activity. Everywhere you look there is somewhere to go and something to do near Eagle Lake at Plantation North. These houses for sale are near all the action so no resident will get left out. Commercial real estate is big in the Greenbrier area too so many of those favorite national chain stores will be close by. Leave your new home to go enjoy a day of shopping at the Greenbrier Mall. Golfers, remember those clubs because they’ll be needed at both the Greenbrier Golf Course and Stumpy Lake Golf Course. Even the family dog will feel included as he can always feel welcome at the dog park. Looking at houses for sale in Hampton Roads may get overwhelming so do yourself a favor and only look at real estate that can make the grade. That new home should be something that strikes pride in the hearts of new owners. At Eagle Lake at Plantation North, pride begins with the builder and continues to the residents. Builders: Classic Design Builders, Reliant Construction Corp. 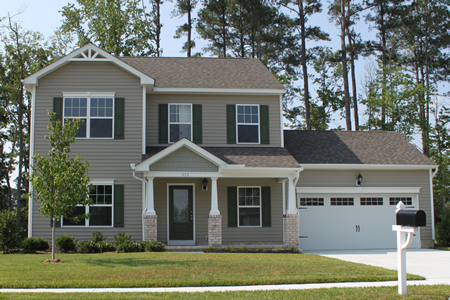 Send me more information about communities similar to Eagle Lake at Plantation North. Our agents gladly offer FREE property tours of Eagle Lake at Plantation North, Chesapeake and homebuyer consultations to all serious buyers.